This article presents the authors’ technique of estimation of Internet users’ motivation. The stages of its standardisation are described in detail, as well as the results of the initial survey of students. 1. Vygonskiy S. I. Obratnaya storona Interneta. Psikhologiya raboty s komp’yuterom i set’yu. Rostov n/D: Feniks, 2010. 316 s.: il. (Vse obo vsem). 2. 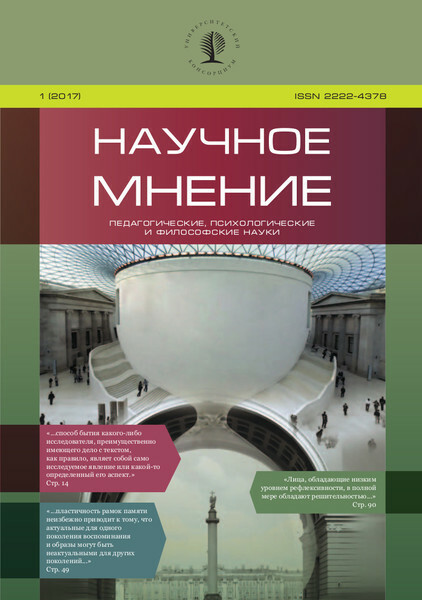 Nosov N. A. Virtual’naya psikhologiya. M.: Agraf, 2000. 432 s.
3. Maslou A. Kh. Motivatsiya i lichnost’. SPb. : Piter, 2011. 352 s.
4. Myasishchev V. A. Lichnost’ i nevrozy. M.: Kniga po trebovaniyu, 2012. 426 s.
5. Caplan S. E., High A. C. Beyond excessive use: The interaction between cognitive and behavioral symptoms of problematic Internet use // Communication Research Reports. 2007. V. 23. P. 265–271. 6. Krant R., Patterson M., Lundmark V., Kiesler S., Mukopadhyay T., Scherlis W. Internet paradox: A social technology that reduces social involvement and psychological well-being? // American Psychologist. 1998. V. 53. P. 1017–1031. 7. Internet addiction: a handbook and guide to evaluation and treatment / ed. by K. S. Young and C. N. de Abreu. USA: John Wiley & Sons, Inc., 2011. 320 p.